In addition to improved productivity and cost savings, IV automation improves quality and accuracy of admixtures. Compounding IV medications is a burdensome manual process that carries considerable risks. As hospitals care for more acute inpatients, the demand for IV medications is on the rise. 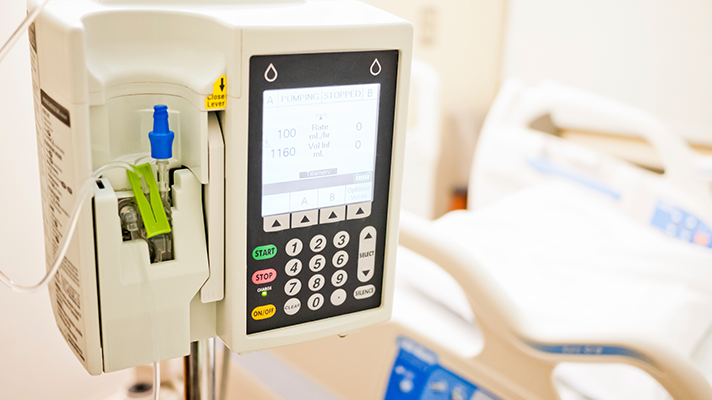 With an eye on improving safety, increasing compliance and reducing waste, an increasing number of hospitals and health systems are looking to insource and automate their IV compounding processes. At Duke University Hospital in Durham, North Carolina, the decision to utilize a compounding robot has yielded positive results. "It was our first attempt at using technology to bring back in-house items that we were purchasing in premixed doses," said Udobi Campbell, associate chief pharmacy officer. Campbell said that the transition to robotic sterile compounding has resulted in a cost savings of $100,000. "Zosyn (piperacillin/tazobactam ) was the first drug we went live with," she said. "Since then we've expanded our complement of drugs that we are using the Robot to prepare." At the core of the technology is Omnicell's REINVENT – Registry for Intravenous Technology in Pharmacy – global, multi-site data registry designed to collect compounded sterile preparation data from hospitals and health systems for evaluation, analysis and insight. The registry provides end-users with an analytics tool that leverages large datasets that's intended to enhance the value of automation technology and improve patient care. "It's exclusive to our IV robot and to our customers who have agreed to share the data with other customers in an anonymous fashion. And the benefit for doing that is we can organize it," said Barickman. REINVENT is free to Omnicell IV customers, stripped of site identification and is HIPAA-compliant. IV robots, according to Barickman, produce thousands of bits of data that are collected in an Oracle database. Omnicell robots interface with the hospital IS system and pharmacy IS system. "We sort out the pieces that are most important to the users/customers as far as planning and using their IV robots – we look at basic parameters like the protocols or recipes that they use for different compounding of drugs on the IV robots," said Barickman. Barickman explained that information is collected and organized in a way that is meaningful and addresses questions that customers might ask. For example: what's the reliability going to be when I run a certain protocol? Historically, the bulk of pharmacy automation was focused on non-sterile areas because that's where 80 percent of the doses are. The IV room, Barickman pointed out, was treated as a separate smaller operation. But that scenario is changing due in part to an increase in sicker inpatients requiring IV medications. "Once customers acquire IV automation and hopefully they participate in the REINVENT data sharing, then they can do benchmarking they can see how they compare to other hospitals to determine how they can make improvements in their operation." Barickman noted that the company has had more than 100 software and hardware improvements to the current generation within the last 12 months. Duke's Campbell said that one of the biggest hurdles that they had to over come was getting staff up to speed and having them be able to trouble shoot when things would wrong. "In our case we started off as a stand-alone compounder," she said. "It was not initially linked to our electronic health record and we were really only focusing on non-patient specific production. We've tested patient-specific doses out of our robot but our main use today has been for non-patient specific doses in a batch mode." There are two categories of IV compounding: batch production of frequently-used products and patient-specific medications. "We have primarily adult patients that we care for – and while the technology allows you to have both preps, bags and syringes, our needs thus far has been around preparations using bags," said Campbell. "It's able to do syringes, it's just not something we have really ventured into." She added: "We were one of the first to setup an interface with our EHR and that essentially worked. But we had to put things on the back burner while we are working through some oncology robotics that we also have and are trying to bring up to speed because some of that has an impact on what we were trying to get done." The next goal, said Campbell, is to be able to provide patient-specific doses through an established interface that they have with the EHR. A team of 12-15 pharmacy and pharmacy technicians are certified to use the equipment and manage the technology. In contrast with the old way of purchasing premixed doses, Campbell noted that the impact of utilizing robotics technology has been cost effective and more efficient in terms of manpower.